Breathing is the process that moves air in and out of the lungs, to allow the diffusion of oxygen and carbon dioxide to and from the external environment into and out of the blood. "Breathing" sometimes also refers to the equivalent process using other respiratory organs such as gills in fish and spiracles in certain arthropods. For organisms with lungs, breathing is also called pulmonary ventilation, which consists of inhalation (breathing in) and exhalation (breathing out). Breathing is one part of physiological respiration required to sustain life. Aerobic organisms (all animals, most plants and many micro-organisms) require oxygen at cellular level to release energy by metabolizing energy-rich molecules such as fatty acids and glucose. This is often referred to as cellular respiration. Breathing is only one of the processes that delivers oxygen to where it is needed in the body and removes excess carbon dioxide. After breathing, the next process in this chain of events is the transport of these gases throughout the body by the circulatory system, and then their uptake or release from the respiring cells. Breathing fulfills another vital function: that of regulating the pH of the extracellular fluids of the body. It is, in fact, this homeostatic function which determines the rate and depth of breathing. The medical term for normal relaxed breathing is eupnea. At the end of each exhalation the adult human lungs still contain 2.5 – 3.0 liters of air, termed the functional residual capacity (FRC). Breathing replaces only about 15% of this volume of gas with moistened ambient air with each breath. This ensures that the composition of the FRC changes very little during the breathing cycle, and remains significantly different from the composition of the ambient air. The partial pressures of the gases in the blood flowing through the alveolar capillaries equilibrate with the partial pressures of the gases in the FRC, ensuring that the ,and of the arterial blood, and therefore its pH, remain constant. The equilibration of the gases in the alveolar blood with those in the alveolar air (i.e. the gas exchange between the two) occurs by passive diffusion. Breathing is used for a number of subsidiary functions, such as speech, expression of the emotions (e.g. laughing. yawning etc. ), self-maintenance activities (coughing and sneezing etc.) and, in animals that cannot sweat through the skin, panting. 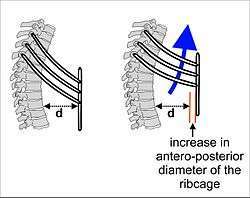 The effect of the contraction of the accessory muscles of inhalation, pulling the front of the rib cage upwards. This increases the antero-posterior diameter of the thorax, contributing to the expansion in the volume of the chest. A similar effect causes the transverse diameter of the chest to increase, because not only do the ribs slant downwards from the back to the front, but, in the case of the lower ribs, also from the midline downwards to the sides of the chest. A cartoon illustrating the mechanisms for forceful inhalation (left), and forceful exhalation (right). During forceful inhalation the diaphragm (the domed, almost horizontal structure in red, between the thoracic cavity (upper compartment) and abdominal cavity (lower compartment), contracts forcing the abdominal contents downwards, causing the abdomen to bulge outwards. At the same time the accessory muscles of inhalation cause the transverse diameter of the thorax to increase as described in the illustration of the movement of the ribs on the left. During forced exhalation the powerful muscles of the abdominal wall pull the lower edges of the rib cage downwards decreasing the antero-posterior and transverse diameters of the chest cavity, while at the same time forcing the abdominal organs up against the diaphragm causing it to bulge deeply into the chest.The force with which air can be expelled from the lungs is considerable greater than the force with which air can be inhaled. This is the result of the power of the muscles of the abdominal wall exceeding that of all the accessory muscles of inhalation. The most vigorous exhalatory efforts occur during coughing, sneezing and the blowing out of, for instance, candles. In mammals, breathing in (inhalation) at rest is primarily due to the contraction and flattening of the diaphragm, a domed muscle that separates the thoracic cavity from the abdominal cavity. When the diaphragm contracts it pushes the abdominal organs downward, but since the pelvic floor prevents the lowermost abdominal organs from moving in that direction, the abdomen, in fact, bulges forwards (or outwards). In the process the size of the thoracic cavity has increased in volume (as has the volume of the body as a whole). This increased thoracic volume results in a fall in pressure in the thorax, which causes the expansion of the lungs. During exhalation (breathing out), at rest, the diaphragm relaxes, returning the chest and abdomen to a position which is determined by their anatomical elasticity (i.e. the position in the cadaver, or in an animal that has been given a muscle relaxant under anesthesia). This is the "resting mid-position" of the thorax when the lungs contain the functional residual capacity of air, which in the adult human has a volume of about 2.5 liters. Resting exhalation lasts about twice as long as inhalation because the diaphragm relaxes more gently than it contracts during inhalation. This prevents undue narrowing of the airways, from which the air escapes more easily than from the alveoli. During heavy breathing (hyperventilation), as, for instance, during exercise, the "accessory muscles of inhalation" (of which the first to be recruited are the intercostal muscles, but include a large number of other muscles – see below) pull the ribs upwards, both in the front and on the sides. This increases the volume of the rib cage, adding to the volume increase caused by the descending diaphragm. During the ensuing exhalation the rib cage is actively pulled downwards (front and sides) by the abdominal muscles, which not only decreases the size of the rib cage, but also pushes the abdominal organs upwards against the diaphragm which consequently bulges deeply into the thorax. The end-exhalatory lung volume is now well below the resting mid-position and contains far less air than the resting "functional residual capacity". However, in a normal mammal, the lungs cannot be emptied completely. In an adult human there is always still at least 1 liter of residual air left in the lungs after maximum exhalation. The entirely unconscious and automatic breathing on which the life of the animal depends can be temporarily over-ridden by conscious or emotion-driven movements of air in and out of the lungs. Speech in humans is generated by a specialized form of exhalation, but other forms of communication (e.g. crying, yelping, yawning, barking, baying, hissing, panting, sighing, shouting, laughing etc.) also rely on a balance between breathing for blood gas homeostasis and the emotional or other messages that need to be conveyed to the animal's conspecifics. Diaphragm, Intercostal Muscles, Scalenes, Pectoralis Minor, Serratus Anterior, Sternocleidomastoid, Levator Costarum, Upper / Superior Trapezius, Latissimus Dorsi, and Subclavius. Internal intercostal, Obliquus Internus, Obliquus Externus, Levator Ani, Triangularis Sterni, Transversalis, Pyramidalis, and Rectus Abdominus. In amphibians, the process used is positive pressure ventilation. Muscles lower the floor of the oral cavity, enlarging it and drawing in air through the nostrils (which uses the same mechanics – pressure, volume, and diffusion – as a mammalian lung). With the nostrils and mouth closed, the floor of the oral cavity is forced up, which forces air down the trachea into the lungs. Nasal breathing is breathing through the nose. The importance of breathing through the nose rather than the mouth was recognized in the 19th century. Hendrik Zwaardemaker (1857–1930) studied this and invented a device to measure the amount of airflow through each nostril. This rhinomanometer used cold mirrors; more recent devices use acoustic technology. Breathing out through the mouth into a cold environment indicates how much moisture the exhaled air can contain. However, breathing out through the nose recaptures much of the moisture, because the nose was cooled and dried when it warmed and moistened the air during inhalation. The exhaled air re-moistens and warms the nasal mucosa, thus drying out and cooling the air before it is expelled into the exterior. It is therefore more difficult to fog up a mirror by breathing on to it through the nose, than by breathing out on to it through the mouth. The nasal passages consist of narrow slits, exposing a large area of mucous membrane to the air moving in (during inhalation) and out (during exhalation) through the nose during each breath. This has several effects. Firstly, the inhaled air takes up moisture from the wet mucus, and warmth from the underlying blood vessels, so that the air is very nearly saturated with water vapor and is at almost body temperature by the time it reaches the larynx. Part of this moisture and heat is recaptured as the exhaled air moves over the partially dried-out, and cooled mucus. The sticky mucus also traps much of the particulate matter that is breathed in, preventing it from reaching the lungs. Secondly, the narrowness of the nasal passages ensures that the single largest resistance to airflow during breathing occurs in the nose. This plays an important role on preventing the collapse of the airways in the thorax during exhalation. As the volume of the thorax decreases during exhalation, air escapes far more easily from the larger pulmonary airways than from the alveoli, simply because their connection to the outside air is more direct than is the connection between the alveolar air and the ambient air. The decrease in volume of these airways is therefore more pronounced than the decrease in the volume of the alveoli – predisposing the airways to collapse during exhalation, particularly in chronic obstructive pulmonary disease and asthma. The high resistance to airflow through the nose prevents this easy emptying of the larger airways, thus keeping the air passages between the alveoli and the exterior open. The resistance to airflow at the exit to the outside air can be increased by breathing out through pursed lips (and not through the nose), a tactic commonly used by persons with chronic obstructive pulmonary disease and asthma. A further function of the nose is that it contains the smell (or olfactory) sensors, which play a role in evaluating the food that is about to be eaten or is being chewed in the mouth (when smell contributes to the flavor of the food), as well as identifying pleasant and unpleasant odors in the environment. Breathing is one of the few bodily functions which, within limits, can be controlled both consciously and unconsciously. Conscious control of breathing is common in many forms of meditation, specifically forms of yoga for example pranayama. In swimming, cardio fitness, speech or vocal training, one learns to discipline one's breathing, initially consciously but later sub-consciously, for purposes other than life support. Human speech is also dependent on conscious breath control. Also breathing control is used in Buteyko method, an alternative physical therapy that proposes the use of breathing exercises as a treatment for asthma and other conditions. Unconsciously, breathing is controlled by specialized centers in the brainstem, which automatically regulate the rate and depth of breathing depending on the body’s needs at any time. For instance, while exercising, the increased production of carbon dioxide by the exercising muscles tends to increase the alveolar (and therefore the arterial) . This is however immediately sensed by the sensor on the medulla oblongata of the brain stem (as well as by the gas tension sensors in the aortic and carotid bodies). These blood gas chemoreceptors send nerve impulses to the respiratory center in the medulla oblongata and pons in the brain. This, in turn sends nerve impulses through the phrenic nerve and other somatic motor nerves to the diaphragm and accessory muscles of inhalation and exhalation, increasing the rate and depth of breathing (hyperventilation). This keeps the arterial blood and virtually unchanged during the transition from rest to vigorous exercise. It is not possible for a healthy person to voluntarily stop breathing indefinitely. If one does not inhale, the level of carbon dioxide builds up in the blood, and one experiences overwhelming air hunger. This irrepressible reflex is not surprising given that without breathing, the body's internal oxygen levels drop dangerously low within minutes, leading to permanent brain damage followed eventually by death. However, there have been instances where people have survived for as long as two hours without air; this is only possible when submerged in cold water, as this triggers the mammalian diving reflex as well as putting the subject into a state of suspended animation. Voluntary hyperventilation can cause arterial carbon dioxide levels to fall to dangerously low levels, leading to paresthesias (a sensation of "pins and needles") round the mouth and in the hands and feet, and a peculiar form of muscular spasms (tetany) of the hands, arms, feet and face. This is usually elicited by anxiety or agitation, and can be very distressing, causing the person to think that they are suffocating when, in fact, they are over-riding their blood gas homeostat, and over-breathing, causing the blood pH to rise to dangerously high levels. The symptoms are brought about by calcium being less soluble under alkaline conditions than under acidic conditions. Thus, during a hyperventilation-induced alkaemia the plasma ionized calcium (Ca2+) level falls, causing many proteins to change their tertiaty (or 3D) configuration. Among the proteins that are most prominently affected are the voltage gated sodium channels of nerve fibres – causing them to randomly generate inappropriate action potentials, which cause the abnormal sensations (paresthesias) and spontaneous muscle contractions (tetany). In addition to air, underwater divers often breathe oxygen-rich or helium-rich gas mixtures. Oxygen and analgesic gases are sometimes given to patients under medical care. The atmosphere in space suits is pure oxygen. Also our reliance on this relatively small amount of oxygen can cause overactivity or euphoria in pure or oxygen-rich environments. Additionally vapors and trace gases are present: 5% water vapor, several parts per million (ppm) of hydrogen and carbon monoxide, 1 part per million (ppm) of ammonia and less than 1 ppm of acetone, methanol, ethanol (unless ethanol has been ingested, in which case much higher concentrations would occur in the breath, cf. Breathalyzer) and other volatile organic compounds. Oxygen is used by the body for cellular respiration and other uses, and carbon dioxide is a product of these processes. The exact amount of exhaled oxygen and carbon dioxide when breathing and the amount of gases exhaled may vary based on diet, exercise and fitness. In regard to the relationship between atmospheric pressure and breathing, when the atmospheric pressure is lower, the air pressure within the breathing system must be correspondingly lower in order for inhalation to occur i.e. lower than the atmospheric pressure (based upon a pressure gradient being established and in keeping with Boyle’s law). This means that in order to achieve inhalation, the air pressure within the breathing system must be relatively lower at high altitudes (low atmospheric pressure) than at low altitudes (high atmospheric pressure); this typically involves a relatively greater lowering of the thoracic diaphragm. In regard to exhalation, when the atmospheric pressure is lower, the air pressure within the breathing system does not need to be as high in order for exhalation to occur; therefore, the diaphragm does not typically need to raise as high in order to achieve exhalation. At low altitudes where the air pressure is higher, inhalation can be achieved with a relatively smaller reduction of the air pressure within the breathing system, and exhalation requires a relatively greater increase of air pressure within the breathing system. Again, this is based upon a pressure gradient being established between the atmospheric pressure and the air pressure within the breathing system. The alveolar air is open (via the airways) to the atmosphere, with the result that alveolar air pressure is exactly the same as the ambient air pressure at sea level, at altitude, or in any artificial atmosphere (e.g. a diving bell, or decompression chamber) in which the individual is breathing freely. With expansion of the lungs (through lowering of the diaphragm) the alveolar air now occupies a larger volume, and its pressure falls proportionately, causing air to flow in from the surroundings, through the airways, till the pressure in the alveoli is once again at the ambient air pressure. The reverse obviously happens during exhalation. This process (of inhalation and exhalation) is exactly the same at sea level, as on top of Mt. Everest, or in a diving bell. A graph showing the relationship between total atmospheric pressure and altitude above sea level. However, as one rises above sea level the density of the air decreases exponentially, halving approximately with every 5500 m rise in altitude. Since the composition of the atmospheric air is almost constant below 80 km, as a result of the continuous mixing effect of the weather, the concentration of oxygen in the air (mmols O2 per liter of ambient air) decreases at the same rate as the fall in air pressure with altitude. Therefore, in order to breathe in the same amount of oxygen per minute, the person has to inhale a proportionately greater volume of air per minute at altitude than at sea level. This is achieved by breathing deeper and faster (i.e. hyperventilating) than at sea level (see below). 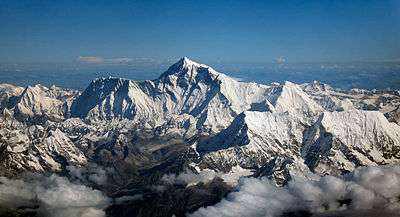 Aerial photo of Mount Everest from the south, behind Nuptse and Lhotse. There is, however, a complication that increases the volume of air that needs to be inhaled per minute (respiratory minute volume) to provide the same amount of oxygen to the lungs at altitude as at sea level. During inhalation the air is warmed and saturated with water vapor during its passage through the nose and pharynx. Saturated water vapor pressure is dependent only on temperature. At a body core temperature of 37 °C it is 6.3 kPa (47.0 mmHg), irrespective of any other influences, including altitude. Thus at sea level, where the ambient atmospheric pressure is about 100 kPa, the moistened air that flows into the lungs from the trachea consists of water vapor (6.3 kPa), nitrogen (74.0 kPa), oxygen (19.7 kPa) and trace amounts of carbon dioxide and other gases (a total of 100 kPa). In dry air the partial pressure of oxygen at sea level is 21.0 kPa, compared to the 19.7 kPa of oxygen entering the alveolar air. (The tracheal partial pressure of oxygen (19.7 kPa) is 21% of [100 kPa - 6.3 kPa]). At the summit of Mt. Everest (at an altitude of 8,848 m or 29,029 ft) the total atmospheric pressure is 33.7 kPa, of which 7.1 kPa, or 21%, is oxygen. The air entering the lungs also has a total pressure of 33.7 kPa, of which 6.3 kPa is, unavoidably, water vapor (as it is at sea level). This reduces the partial pressure of oxygen entering the alveoli to 5.8 kPa, or 21% of [33.7 kPa – 6.3 kPa = 27.4 kPa]. 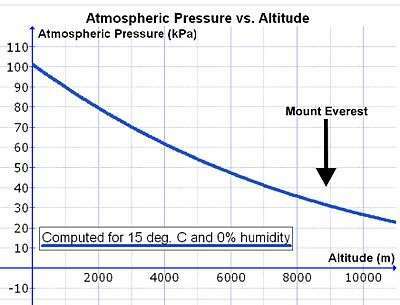 The reduction in the partial pressure of oxygen in the inhaled air is therefore substantially greater than the reduction of the total atmospheric pressure at altitude would suggest (on Mt Everest: 5.8 kPa vs. 7.1 kPa). A further minor complication exists at altitude. Consider the following theoretical scenario. If the volume of the lungs were to be instantaneously doubled at the beginning of inhalation, the air pressure inside the lungs would be halved. This happens regardless of altitude. Thus, halving of the sea level air pressure (100 kPa) results in an intrapulmonary air pressure of 50 kPa. Doing the same at 5500 m, where the atmospheric pressure is only 50 kPa, the intrapulmonary air pressure falls to 25 kPa. Therefore, the same change in lung volume at sea level results in a 50 kPa difference in pressure between the ambient air and the intrapulmonary air, whereas it result in a difference of only 25 kPa at 5500 m. The driving pressure forcing air into the lungs during inhalation is therefore halved at this altitude. The rate of inflow of air into the lungs during inhalation at sea level is therefore twice that which occurs at 5500 m. However, in reality, inhalation and exhalation occur far more gently and less abruptly than in the example given. The differences between the atmospheric and intrapulmonary pressures, driving air in and out of the lungs during the breathing cycle, are in the region of only 2-3 kPa. A doubling or more of these small pressure differences could be achieved by only very minor adjustments to the breathing effort at high altitudes. All of the above influences of low atmospheric pressures on breathing are accommodated by hyperventilating. The exact degree of hyperventilation is determined by the blood gas homeostat, which regulates the partial pressures of oxygen ( ) and carbon dioxide ( ) in the arterial blood. This homeostat prioritizes the regulation of the arterial partial pressure of carbon dioxide over that of oxygen at sea level. That is to say, at sea level the arterial is maintained at very close to 5.3 kPa (or 40 mmHg) under a wide range of circumstances, at the expense of the arterial , which is allowed to vary within a very wide range of values, before eliciting a corrective ventilatory response. However, when the atmospheric pressure (and therefore the partial pressure of oxygen in the ambient air) falls to below 75% of its value at sea level, oxygen homeostasis is given priority over carbon dioxide homeostasis. This switch-over occurs at an elevation of about 2500 m (or about 8000 ft). If this switch occurs relatively abruptly, the hyperventilation at high altitude will cause a severe fall in the arterial partial pressure of carbon dioxide, with a consequent rise in the pH of the arterial plasma. This is one contributor to high altitude sickness. On the other hand, if the switch to oxygen homeostasis is incomplete, then hypoxia may complicate the clinical picture with potentially fatal results. Gases breathed underwater are at higher pressure than at sea level due to the added weight of water. This can lead to nitrogen narcosis and/or oxygen toxicity, and decompression sickness if the person returns to the surface too rapidly. In t'ai chi ch'uan, aerobic training is combined with breathing to exercise the diaphragm muscles and to train effective posture; making better use of the body's energy. In music, breath is used to play wind instruments and many aerophones. Laughter, physically, is simply repeated sharp breaths. Hiccups, yawns, and sneezes are other breath-related phenomena. Ancients commonly linked the breath to a life force. The Hebrew Bible refers to God breathing the breath of life into clay to make Adam a living soul (nephesh). It also refers to the breath as returning to God when a mortal dies. The terms "spirit," "qi," "prana" and "psyche" are related to the concept of breath. Also cognate are Polynesian Mana and Hebrew ruach. In his book Your Atomic Self: The Invisible Elements That Connect You to Everything Else in the Universe, excerpted in Wired Magazine, Curt Stager explores the atomic and molecular basis of links through which breathing connects humans and other Aerobic organisms of birds, mammals, and reptiles to the entire planet. Common phrases in English relate to breathing e.g. "catch my breath", "took my breath away", "inspiration", "to expire", "get my breath back". ↑ Peter Raven; George Johnson; Kenneth Mason; Jonathan Losos; Susan Singer (2007). "The capture of oxygen: Respiration". Biology (8 ed.). McGraw-Hill Science/Engineering/Math;. ISBN 0-07-322739-0. ↑ Kevin T. Patton; Gary A. Thibodeau (2009). Anatomy & Physiology (7 ed.). Mosby. ISBN 0-323-05532-X. 1 2 Tortora, Gerard J.; Anagnostakos, Nicholas P. (1987). Principles of anatomy and physiology (Fifth ed.). New York: Harper & Row, Publishers. pp. 556–557, 570–572. ISBN 0-06-350729-3. ↑ All You Need to Know About Inspiratory Muscles Part II Archived December 2, 2015, at the Wayback Machine. ↑ Ramey CA, Ramey DN, Hayward JS. Dive response of children in relation to cold-water near drowning. J Appl Physiol 2001;62(2):665-8.Source: Diana Hacker (Boston: Bedford/St. Martin’s, 2002).Adapted from Victoria E. McMillan (Boston: Bedford/St. Martin’s, 2001). See it cited here "Archived copy" (PDF). Archived from the original (PDF) on 2007-07-05. Retrieved 2007-05-24. ↑ "Longest time breath held voluntarily (male)". Guinness World Records. Retrieved 2016-11-29. ↑ Armstrong CM; Cota G (Mar 1999). "Calcium block of Na+ channels and its effect on closing rate". Proceedings of the National Academy of Sciences of the United States of America. 96 (7): 4154–7. Bibcode:1999PNAS...96.4154A. doi:10.1073/pnas.96.7.4154. PMC 22436 . PMID 10097179. 1 2 P.S.Dhami; G.Chopra; H.N. Shrivastava (2015). A Textbook of Biology. Jalandhar, Punjab: Pradeep Publications. pp. V/101. ↑ Biology. NCERT. 2015. ISBN 81-7450-496-6. 1 2 "Online high altitude oxygen calculator". altitude.org. Retrieved 15 August 2007. ↑ Tyson, P.D. ; Preston-White, R.A. (2013). The weather and climate of Southern Africa. Cape Town: Oxford University Press. pp. 3–10, 14–16, 360. ISBN 9780195718065. ↑ Diem, K.; Lenter, C. (1970). Scientific Tables (Seventh ed.). Basle, Switzerland: Ciba-Geigy. pp. 257–258. ↑ Koen, Chrisvan L.; Koeslag, Johan H. (1995). "On the stability of subatmospheric intrapleural and intracranial pressures". News in Physiological Sciences. 10: 176–178. ↑ West, J.B. (1985). Respiratory physiology: the essentials. Baltimore: Williams & Wilkins. pp. 21–30, 84–84, 98–101.